De Pelikaan is an almost 200 year old Dutch company that sells a wide selection of teas. 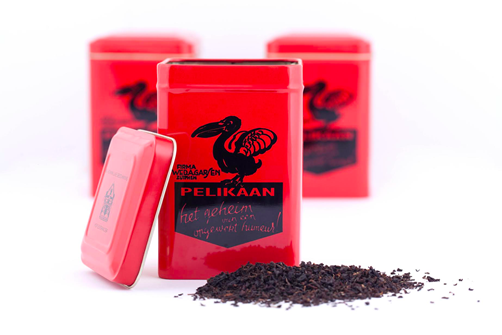 Until now the teas were not available in the US, but NYC-based design store Kikkerland will now be selling a selection of De Pelikaan teas. If you live in the NYC area and are curious to try this beloved brand of teas from the Netherlands, be sure to mark Thursday May 7th on your calendar! The West Village Kikkerland store will carry 11 different teas from De Pelikaan, and I'm happy to share that I will be helping to brew and serve up samples of a few selected teas at the shop from 4-8pm. Can you make it to the event? I'd love to see you there! If you are unable to make it or don't live in the NYC area, Kikkerland will soon sell all of the teas on their website. Tea Tasting at Kikkerland: Thursday, May 7th 4-6pm. 493 6th Ave, NY, NY.